My little girl just turned 4 today, Wohoo! it's quite an amazing journey with my little girl, I learned a lot in life and the experience of being a Mom is just AMAZING! 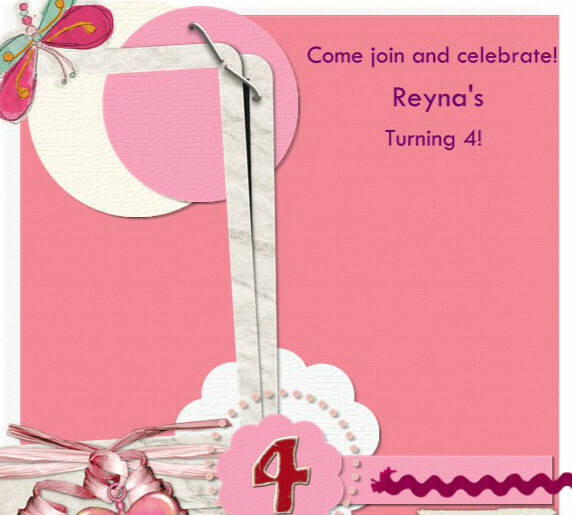 For now, I made her invitation online, complete with her picture on the left and venue on the right, She LOVE PINK! Happy Birthday, Reyna Bear. We love you! Happy blessed birthday! May the good Lord shower your years with blessings! Happy Birthday Reyna girl! Enjoy the day Mommy! Happy Birthday to your daughter! Blessings to your family especially to her. Very nice invite! Happy 4th Birthday Reyna! Happy Birthday to your princess...Our little prince will turn 3 in few days. Nice color, very girly yet still with a hint of babyness. Happy birthday Reyna! Happy birthday, baby Bear! :) Good health and happiness all the days of your life. Oh wow, 4 years old! Happy birthday, Reyna! You're almost a big girl!